You thought he was retired, even dead? No, he is back! At the age of 86, Mike Tomkies is back doing what he does best – observing our rarest and most dramatic wildlife, unsuspected and from close quarters, and writing about it with the kind of intimate detail that has earned high acclaim from critics and conservationists. Within days of arriving back from five years of studying bears, wolves and lynxes in Spain, he is up a wild cliff in Cornwall watching three peregrine falcon chicks from hatching to flying stage. We can follow his astounding adventures over the next ten years as he obsessively searches all through Britain for that elusive ‘small wild paradise’ so many of us would also like to find. He lives in, but finally loses, no less than six new homes in that time and the complications and reasons why are both hilarious and sad. Even more fascinating is his continual obsessive quest to get up close and personal with nesting goshawks, buzzards and ospreys, as well as mammals like fishing otters, a fox family and he even feeds wild badgers by hand. At one remote farmhouse in the Borders, he learns how to handle a bulldozer, digs out his own 70-yard lake and stocks it with trout. Over three years there he raises ten barn owl chicks and establishes three breeding pairs in areas where they had long been absent. It was the most successful barn owl release at the time. There are many amusing anecdotes such as when he dreaded taking some of Prince Harry’s classmates to ‘otter bay’ and then saw far more otters than when he had gone there on his own! Transcending all are his new studies and descriptions of hunting and nesting golden eagles, during which he passed his 3,050th hour in one of his home-made ‘invisible’ hides, and a huge female allowed him to bring much-needed meat to her chicks in their eyrie. 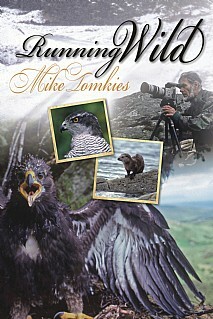 The book ends with triumphant filming of the magnificent white-tailed sea eagles on Mull, hunting and sailing into their high nest with prey and feeding their chicks. Mike also achieved valuable publicity for the pioneering public sea eagle hide project on Mull. This is a real must for anyone interested in wild nature, and the profound experiences of a leading naturalist with rare major species. It will also be a magnet for all Mike Tomkies’ loyal fans.